The famous “blackbird singing in the dead of night” is the (Common) Blackbird of Europe, Turdus merula. Ditto the “four and twenty” baked in a pie. The Blackbird is a thrush, part of the family Turdidae, like the American Robin, which also shares the same genus. The “thrush” appellation tells you to expect some lovely singing. Our American “blackbirds” are like our “seagulls,” just a general term, really, not speaking directly to a single species. We have Red-winged, Yellow-headed, Rusty, and Brewer’s Blackbirds (with the Tricolored Blackbird out west); these birds are all in the Icteridae family and can be very noisy, but are generally not lauded as charming singers. 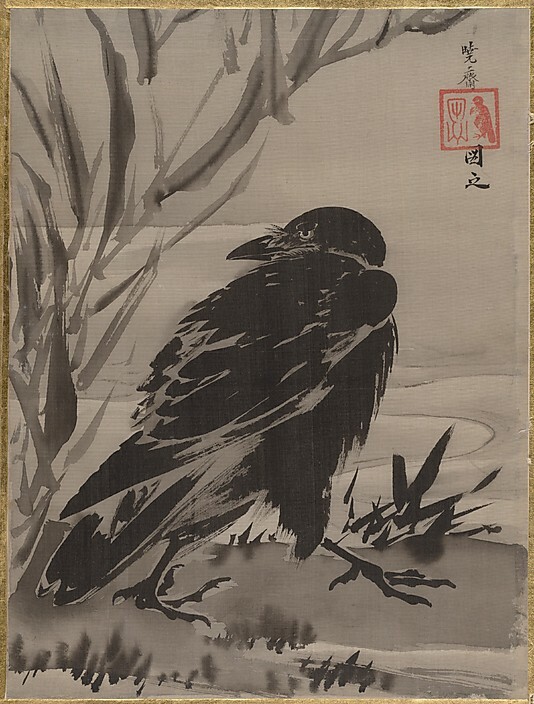 The magnificent — to me, anyway — croaking of crows and ravens come from birds in the Corvidae family; they are also famously black-feathered birds. Wallace Stevens doesn’t seem to have been a birder, so the blackbirds in “Thirteen Ways of Looking at a Blackbird” may be taken as poetic license, not a particular species to be found in the poet’s Connecticut. 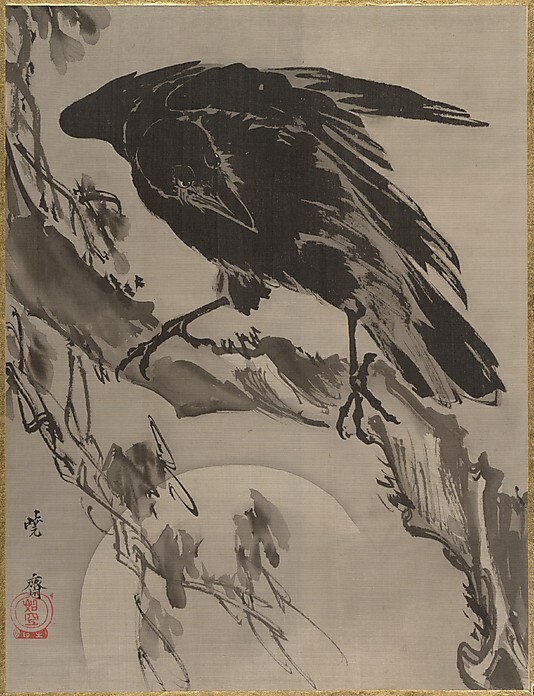 The poem is prominently posted next to thirteen paintings by Kawanabe Kyosai in the Asian Art wing of the Metropolitan Museum until July 28, part of in an exhibit called “Birds in the Art of Japan.” Kyosai’s black birds are crows — Carrion crows (Corvus corone, a species also found in Western Europe) by the look of them, and not Japan’s other crow species, the Jungle crow Corvus macrorhynchos — and are a revelation. 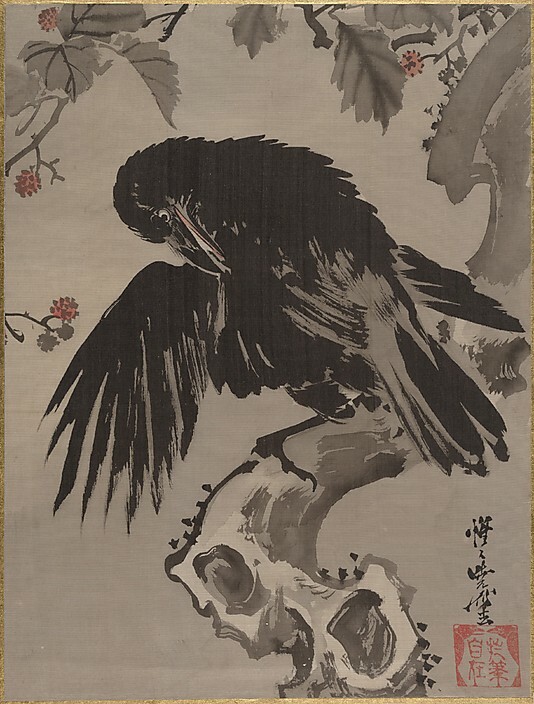 Kyosai’s sublime brushwork belies the fact that close observation of crows reveals the blue and purple iridescence of their feathers, making the whole notion of a “blackbird” even more complicated. Three years ago today, Backyard and Beyond began as a blog. Thank you for coming along for the ride. New to the pool? Consider a free subscription for email delivery. 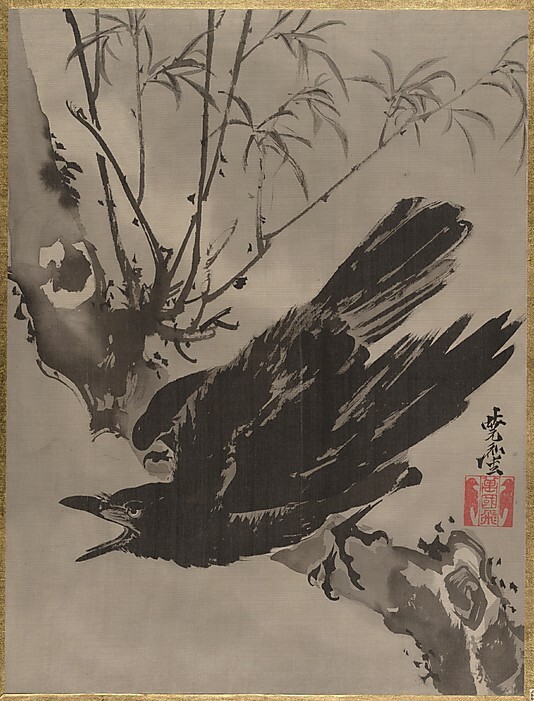 Kyosai’s brushwork of the birds is positively (or negatively…) so good! I also like the leaves and the fruits of the mulberry. The somewhat nasty cry of the Red-winged is nonetheless an impressive sign of the bird saying “I’m here!” or “Now summer opens!”. Well that’s maybe true for Montréal… Congrats on your blog’s third birtday. I’m an happy suscriber. Thanks! Thank you, Roger. Red-wing bbs are indeed a vocal sign of the spring. Six of them have been hanging out in Prospect Park, an advance guard of the influx. Happy Anniversary to the blog, and thank you for all the work you do on it, Matthew. I look forward to it every day, and it’s the first email I open after any personal messages. I think yellow-headed blackbirds (lovely as they are) are a midwestern and western species, though a few make it east each year. Should we include starlings in breeding plumage and grackles in the list of “black birds”? Thank you, Elizabeth. It must have been a case of wishful thinking there on the Yellow-headed. I’ve only seen them in New Mexico. Great anniversary post! I read the blog every day as I subscribe to it. The Crow in Snow is especially good. I have never been impressed with Stevens “13 Ways,” although I am an admirer of his less abstract poems. We seem to be getting fewer and fewer red-winged blackbirds here every spring, but I have already seen one passing through. Thank you, AG. Sorry to hear about the smaller numbers of Red-winged blackbirds — perhaps my favorite bird, I mean, if I was pressed to name just one. Unfortunate fact is that most species numbers are dwindling. Really great post (they all are)! I love black and white images, and I love any discussion of crows (or almost crows). Congratulations on sustaining the madness of keeping a blog for three years. I’ll keep coming back! Thank you, Paul. Somewhat of a challenge in the winter months to put together posts, but culture does keeps coming through! Thanks, Elizabeth. I didn’t even think of looking there. Two of these are wood-block prints for a different take, or medium, on the subject. 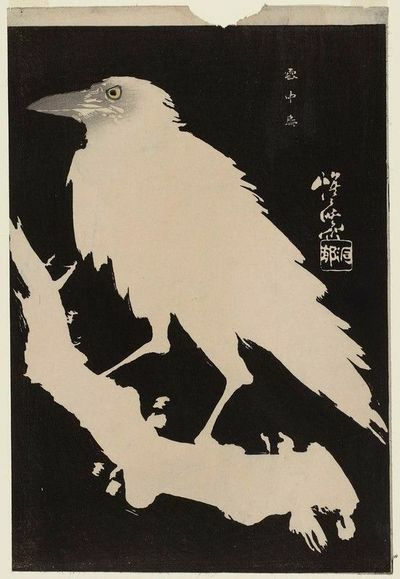 Love the expression of the crow in the book.